Coyotes are becoming a problem for a friend. To assist, we’ve put together a new rig for night varminting. Keltec RMR30 (22WMR autoloader) with Gemtech sound suppressor (also to remove muzzle flash). 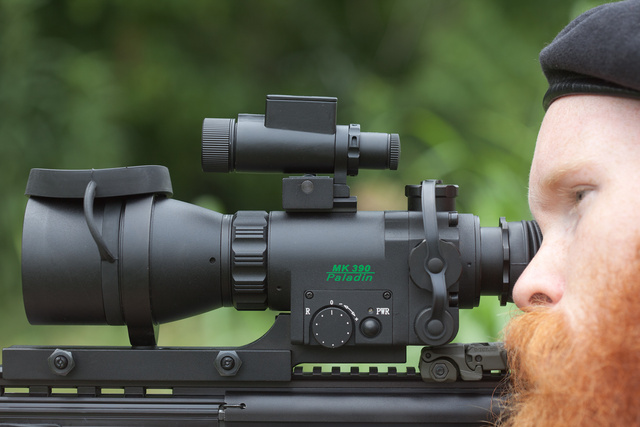 Folding “iron” sights for daytime use, 4x night scope with infrared illuminator for darkness. Lightweight PMR30 pistol that uses the same ammunition and magazines as backup. In use photos as soon as I get a camera adapter. This entry was posted in holster, pistol, rifle, sound suppressor, weapon and tagged 22WMR, ATN, infrared, keltec, night vision, NVG, optic, scope. Bookmark the permalink. BDU pants? He needs a Tacti-Kilt! 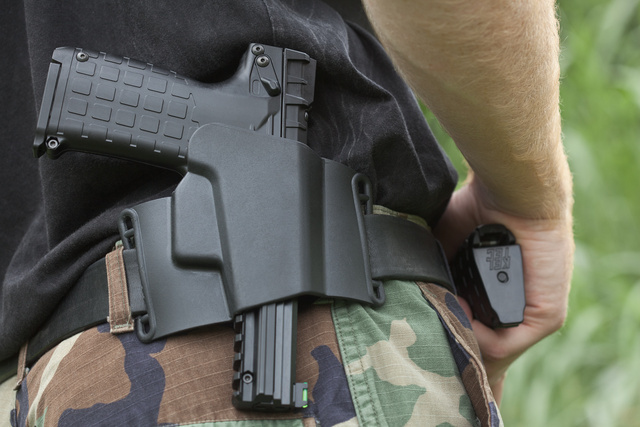 How about a Neokilt with a holster pocket? 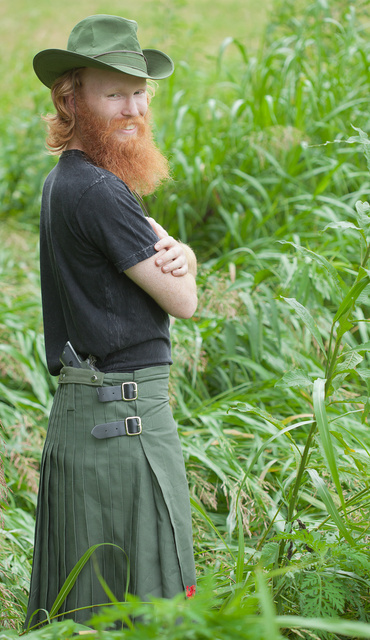 That’s a nice looking kilt, especially the holster pocket. I’ve had a black workman’s Utilikilt for a number of years, while it does have a multitude of pockets, including detachable ones, that holster pocket may seal the deal for me. I carry my Taurus pt 24/7 all the time in a IWB holster even when im wearing my kilt and its no problem at all. Just leave the shirttails out or wear a vest to cover it. Nice chin pelt. I’m almost jealous of it. Really jealous of your PMR-30! the front site on that pistol ain’t gonna snag on the holster when it’s most inconvenient, will it!? Front sight won’t but the Picatinny rail could, so it needs to have a rail cover attached. That .22 WMR seems like a hobbit battle rifle cartridge to me. I mean, 7.62×54 berdan primed is cheaper to shoot here, if you can get the surplus machinegun rounds. International arms dealers, that bunch of .. can get five rounds of 7.62×54 for 1 .22 WMR.. When it comes to tinnitus and muzzle-flash per buck, it’s a clear winner. And self-loading rifles in that caliber have been graciously subsidized for civilian use by no other country than the Stalin’s USSR? How cool is that, as a free man, to have a rifle that was bought and paid for by oppressive commies ? And 7.62×54 is sufficient for all kinds of varmints, even the body-armored, assault-rifle toting clown-shoed, especially if deployed from cheap and effective weapons like the Degtaryev MG.
22WMR is suboptimal for defense. It’s a niche defense round for people who can’t handle weight and recoil. For varminting, it’s a nice, comfortable low-recoil round. 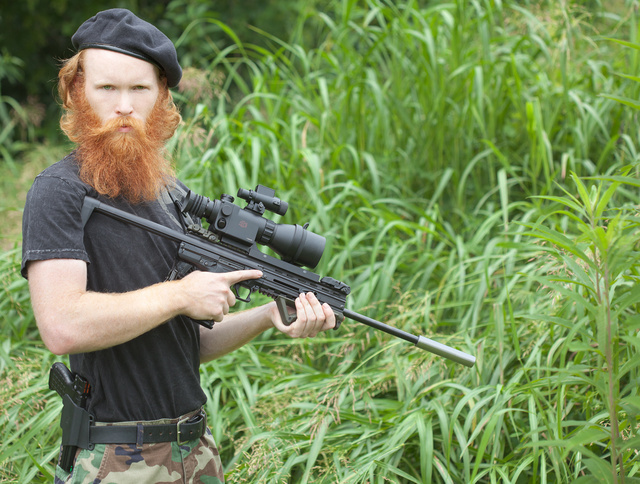 An accurate 7.62×54 rifle with a suppressor and night vision attached would weigh more than a person could comfortably carry on a walk. I have three rifles in that caliber but I have no illusions about them being very useful for shooting coyotes at night. Different people have different levels of comfortable. Night vision -600 gramms. Supressors.. hmm.. 0.8 kilo. Mosin carbine with a synthetic stock .. 3.3 kilos.. total <5 kilograms. Imo, can be carried comfortably..
Well… I suppose I should try to imagine I were 5'5" tall and a woman… I can't imagine that.. the idea of not being taller than almost everyone is just absurd to me. holy crap on a crap stick, i want that gun! tell me more about the scope? Redesign already came and the new PMR30s are in production. The differences are minor — twist rate is higher and barrel fluting is gone. Be advised that coyote hunting is only legal from 1/2 hour before sunup to 1/2 hour after sundown according to the TWRA Hunting and Trapping guide. If your friend is having trouble with yotes, have him contact me. Thank you. With 1+ generation night vision, twilight is the best time for hunting anyway. This optic works best with twilight, bright moon or IR illuminator. That means a De-Lisle with night sight is in order, I guess.. I know that guy, He represents the best of his generation, and those thinkers like him are the best hope of us all. Who makes that PMR30 holster? It’s a Glock sports holster, PMR30 fits pretty well. Brian, I do not like you for your beard outpaces mine by quite a bit.. Massive kudos to your chin sweater, sir. Oh, and the picture that’s displaying it along with its author!